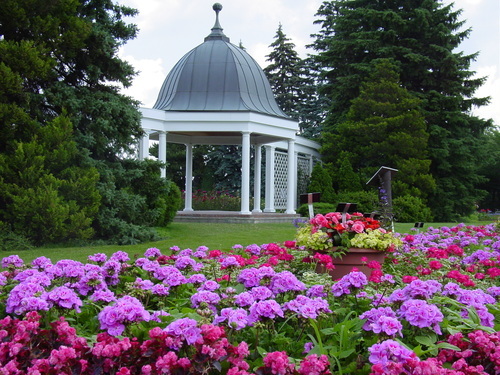 Established in 1936, the Botanical Gardens offers 40 hectares (99 acres) of impeccably-maintained lush gardens, including perennials, rhododendrons, azaleas, a formal parterre garden, shade, herb and vegetable plantings, an aviary as well as our world-famous rose garden featuring over 2,400 roses. Meandering brick and paved footpaths wind past the Butterfly Conservatory and the butterfly garden, and around small ponds to an arboretum featuring one of Canada�s finest collections of ornamental trees and shrubs. Horticultural excellence is the emphasis of The School of Horticulture and the students are responsible for the maintenance and development of the Botanical Gardens throughout the year.